MOSCOW, Russia -- Russia's defence ministry has announced it is holding military exercises this week involving 100 aircraft in the west of the country near the Ukraine border. Russian exercises in the region are seen as a show of strength in the conflict with Ukraine. A spokesman said fighter jets, helicopters and the latest bombers would take part in the operation. 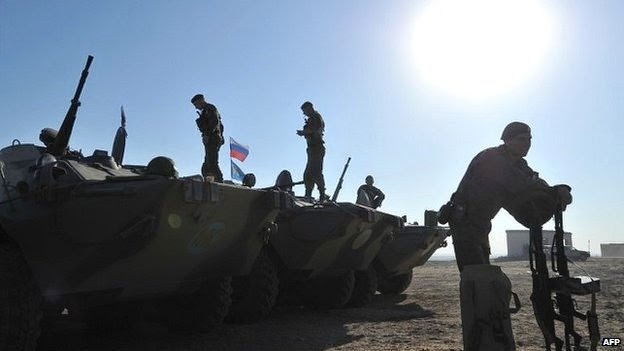 Every time Russia announces a new round of military exercises it is seen as a show of strength in the conflict with Ukraine, a BBC correspondent says. Ukraine says it is gaining ground against rebels in the country's east. Civilians there are preparing for a siege as government forces close in on the rebel-held cities of Donetsk and Luhansk. Residents are stockpiling food and supplies and are sleeping in basements, with reports suggesting Luhansk is virtually surrounded and without power. Western governments and Ukraine accuse Russia of supplying heavy weapons and volunteers to the pro-Russian rebels, who have declared independence from Kiev. Russia denies supplying such hardware to the rebels, while condemning Kiev's military offensive in the east. The Russian spokesman did not mention Ukraine in his announcement on the military exercise. He told the Interfax news agency that the exercise was the first in a series intended to improve the unity of the air force. He said it would involve Sukhoi Su-27 and MiG-31 fighter jets, Mi-24 and Mi-28 helicopters and Russia's newest frontline bomber, the Sukhoi Su-34. Russia has previously been accused of boosting its troops and weaponry along the border with Ukraine. A group of Ukrainian soldiers is reported to have retreated into Russian territory because they ran out of ammunition during fighting with the separatists. At one point during the fighting, soldiers of the 72nd motorised brigade split into two groups, the Ukrainian news agency Unian reports. Then one of the groups ran out of ammunition and supplies, and some of their military vehicles on the battlefield were damaged, prompting them to flee across the border, a spokesman for the Ukrainian "anti-terrorist" operation in Donbass told the RBK-Ukraina news website. Unian did not mention in its report how many soldiers were involved, but a Russian security official said that there were more than 400. The soldiers have asked for asylum in Russia, according to the official from Russia's FSB intelligence service in the Rostov region, just across the border from Ukraine.